It's been a while since I read a fantasy book that gave me such mixed feelings. 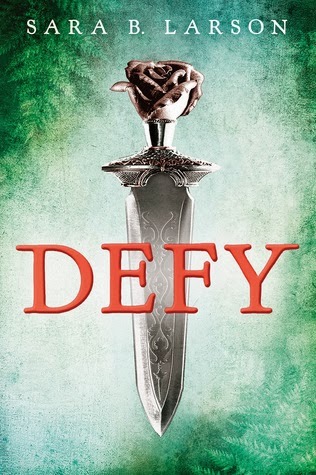 Overall, I really enjoyed Defy, besides two big problems: the love triangle and the world-building. The world-building had SO much potential, but it felt wasted. There was pretty much no description of the setting. Some books can get away with this, but fantasy novels should always have a lot of world-building and description of the setting. Now, what's interesting is that a good portion of Defy is set in a jungle. I thought this was unique and different as far as fantasy novels go, but there simply wasn't enough description of it. I also would've loved more backstory on the kingdom and fantasy world. I was disappointed in the love triangle too. My rating would probably be much higher if not for the romance. It's not just that I disliked the romance, it's the fact that it takes up so much of the story. It disrupted the action and the flow of the plot. I do have to say that I quite liked Prince Damian, though. He's such a complex and likeable character, even though he comes across as arrogant at first. He was easily my favorite character. Rylan, on the other hand, I found to be slightly boring. Yes, he's a good friend to Alex, but it was hard to see him as anything more than a friend. Besides those two problems, there wasn't much else I disliked. A couple things stuck out - like, what's up with Alex blushing literally all the time? And why does the dialogue have to sound so modern? But aside from that, I thought this was a fun and fast-paced read. Alex is a strong, likeable main character, and I really loved the intricate plot. It was great for a fantasy novel. I was caught up in Alex's quest to overthrow the king and save her kingdom. And I absolutely loved how, as the plot progressed, different secrets would unfold and the intrigue increased. The author did a fantastic job of building the plot to a thrilling climax, and I was completely sucked in to the last quarter of the book. Despite a few flaws, Defy is a fast, fun read. The characters of Alex and Damian were well-developed and three-dimensional, and the action-packed plot sucked me in with its twists and turns. It reminded me a lot of the TV show Merlin, what with the fantasy world and the use of magic. Even though I disliked the world-building and love triangle, this was still an immensely enjoyable, entertaining read and I'd recommend that fantasy fans give it a try.